Not long ago I reached out to Wacaco to see if we could test out their new Nanopresso, which is a hand-activate espresso machine! I’ve been dying to find good coffee when I’m on campus, since they serve, what I call, dishwater coffee, so this device seemed to be an answer sent from up above. All you need is ground coffee and boiling water. That’s it! Many outdoors enthusiasts own this espresso machine, and I can see why! It’s portable, takes up a minimum amount of space, doesn’t require any electricity to get it running, and offers you the best of the best in terms of outdoor coffee experience. I must admit, I’m not much of an outdoorsy person; don’t get me wrong, I do enjoy the occasional camping trip and hike, but you won’t really ever find me portaging a canoe over rocky terrain for hours on end. I had a hunch that the Nanopresso would however answer my need of good coffee options. See, my grad student office has very few power outlets, isn’t near any cafeteria, and doesn’t have much space for things that aren’t approved by the department. The Nanopresso (as well as Wacaco’s Minipresso) would be a perfect solution for any student or person living in tiny spaces that don’t allow for much “extra” necessities that aren’t essential… However, I will be the first to debate by saying that a coffee/espresso machine is an essential need, at least for me! 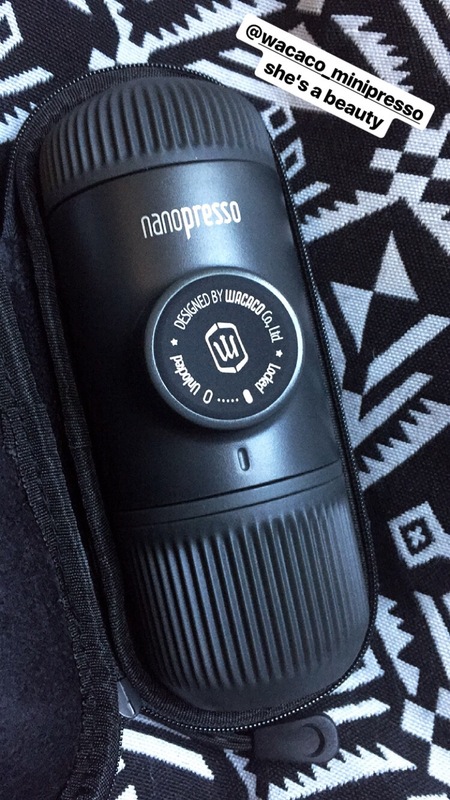 The Nanopresso came in a nice, hard shell zip-up case, which is an additional bonus: transportability and offers protection to your investment. Once you open it up, you’ll find a pill shaped device waiting to be used! It is quite simple to use, although you do have to go through a few steps. The Nanopresso comes with a built in espresso cup, which is great, that pops off one end, to reveal the water tank. Oh, by the way, inside the water tank, you will find a scoop and brush! Step 1: You need to disassemble the parts of the Nanopresso by popping off the coffee cup, twisting off the water tank, and twisting off the filter head. Step 2: Boil some water and find some ground coffee. Step 3: With the provided scoop, measure out between 7 and 8g of ground coffee and lightly press into basket. You’ll notice that you can clip the basket and the scoop together, which makes it super easy to transfer the grounds and tap them out lightly. With the flat bottom part of the scoop, you can tamp down the coffee, but don’t put too much pressure or you’ll have trouble pumping the coffee out later. Step 4: Once the coffee basket if filled with coffee, put it back into the filter head and screw it shut. Step 5: Pour the boiled water (it can take up to 80ml of water) in the water tank, making sure not to go over the fill line (you’ll risk having water seep out and burn you). Step 6: Screw the tank onto the Nanopresso body, and release the press by twisting it slightly. ​Step 7: Flip the unit upsidedown, so that the coffee basket end is pointing towards your cup. Step 8: Actively press your coffee out and enjoy! For ease of use: 8/10. Since it is a bit finicky to get all the pieces disassembled, then assembling it all over again. For those of you using it on an outdoors trip, find a flat surface to put everything down, that way you won’t forget pieces or assemble it backwards. You will need to have on hand a) a kettle and water, or b)pre-boiled water in a thermos, or c)fire pit + fire + kettle and ground coffee. For design and packaging: 10/10. Wacaco thought their product through, and provide a scoop and brush, which are super useful when it comes to dosing and cleaning. If you do lose the scoop, then you’ll be stuck trying to figure out the weight of your coffee either by measuring spoon or with a scale. I did weigh out my coffee and the scoop consistently picks up between 7 and 8g, which is the recommended amount of coffee. As for packaging, the carrying case and the Matroyshka-esque assembly (equipment nestled within equipment) cuts down on excessive packaging and waste, as well as securing your Nanopresso while carrying it around. I do believe that the Nanopresso is an excellent investment for students in dorms, offices, etc., as well as for outdoor activity use. It takes up a minimal amount of space, it is easy to use and clean, and for most students, getting boiling water is fairly easy (either by having a kettle in your dorm or at the cafeteria). 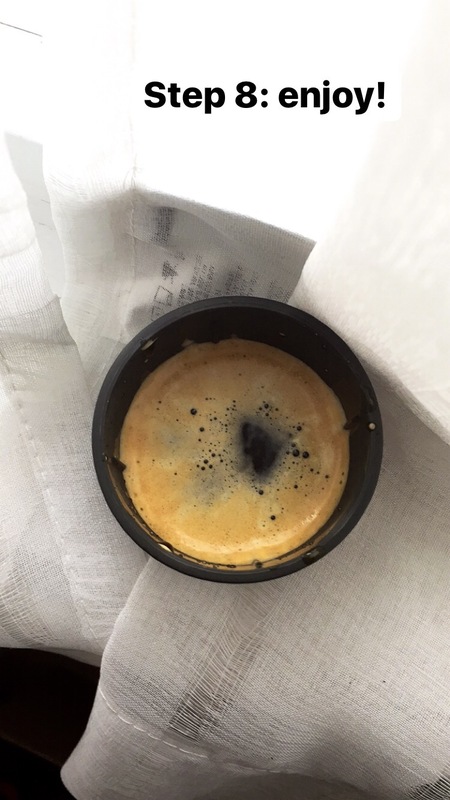 This is what you’re probably waiting for… how did the coffee taste?! Well, it was amazing. I do believe that it rivals a standard espresso machine in terms of taste, however, it will take some time to play around with the water temperature and size of grind to achieve the perfect cup. Having an 18 bar pressure pumping system, the Nanopresso does pretty much what a standard machine does. I do believe that this is a VERY big step up from what is offered at most university campus cafeterias and standard offices, and obviously way better than cowboy coffee when camping! Price-wise, you’ll be spending somewhere between 80 and 100$, depending on where you go to buy it. It may seem like an initial big spend, but think about all the money you’ll save by not going to Starbucks or the cafeteria to get your shot of caffeine. Keeping in mind that there is no additional electricity-related costs (other than getting your kettle boiling), I do think that this is a very good investment! Overall, the Nanopresso falls into my essential non-essential list of things I own. Out of all the tech stuff I have, I do think that this is a perfect piece of coffee-related equipment to own, especially seeing that I like having a cup of coffee/espresso in the middle of the day at the office. It’s takes just about the same time to make it as it would making it with a traditional espresso machine, and saves you the money at the same time. Now, if you need to have your milk and sugar, usually your caf/student fridge/office fridge will contain those things, so you’re ok there, but if your in the mood for a latte, invest in a 15$ milk frother and you’re set! It would make an excellent Christmas gift to anyone that is looking to buy their S/O something special! Previous Post Coffee Review: Rescue Coffee Co.